Coffee at ReachOut is an opportunity for those in the Fond du Lac, Wisconsin area to drop by and sip something hot (or cold) and talk about Bible Translation. Not in the Fond du Lac area? You could join the conversation via Skype! Everyone is welcome!! Coffee at ReachOut often happens at the spur of the moment so keep an eye out for an announcement on the Facebook book page. Of course, you can always contact Carla and create your own Coffee time. 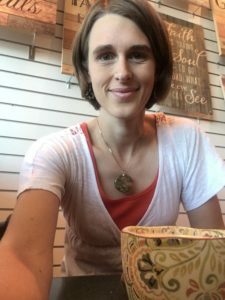 Carla loves coffee and the opportunity to share about her work and Bible translation!